August 2017, Issue 184 | Samuel Shapiro & Company, Inc.
On June 27, 2017, Customs and Border Protection (CBP) announced a delay in the development of the Automated Commercial Environment (ACE) post-release capabilities that had been scheduled for July 8, 2017. Importers will have to wait and see as retraining will be provided by CBP for Customs personnel and CBP will be providing updated materials on each capability prior to these scheduled deployments. Your drawback provider will be able to guide you as to what capabilities are available as CBP deployments roll out. Drawback options are listed below. Between February 2018 and February 2019, trade users will have the option to file either Core Drawback or TFTEA Drawback. For additional information, please visit CBP’s ACE and Automated Systems page under What’s New with ACE for guidance, timelines, and FAQ’s on Drawback, Duty Deferral, Liquidation, Reconciliation and ACE Reports. The October 25, 2017 exam will be conducted in electronic format. The examination will be given at various locations. The registration for the October 2017 exam is anticipated to open in August 2017. Customs has posted a “Sample Custom Broker Electronic Examination” on their website (http://usahire.opm.gov/assess/sampletest/landing). The sample exam is timed (4.5 hours) but is not graded upon completion. An applicant can take the practice exam as many times as desired. Since the applicant will not have the paper exam booklet to take with them, it is anticipated the exam will be posted on Customs website the following day. On this first electronic exam, results are expected to be sent approximately 3 weeks after the exam. For following exams, Customs expects result return times to be closer to 2 weeks. The cyber-attack in late June that crippled the Maersk Group’s system not only caused a short-term disruption in many shippers’ supply chains but it also laid bare how vulnerable the industry is to this type of attack. Over the past decade, ocean carriers, marine terminals, truckers, forwarders, and shippers have focused extensively on integrating their computer systems to allow for increased visibility and efficiency. This same integration also leaves each party increasingly dependent on outside members of their supply chain for that data, and a loss of service by any one partner could cause a ripple throughout the chain, possibly knocking out operations for other companies. The attack carried out against Maersk, part of the ransomware virus known as “Petya,” struck thousands of computers globally and impacted many companies and industries aside from Maersk and its subsidiaries. When Maersk’s systems went down, it immediately impacted their ability to book and move cargo shipping on Maersk vessels. It also impacted the visibility that alliance members, like MSC, would have on their cargo. Maersk marine terminals around the globe were shut down, which meant that shippers were unable to move containers on or off terminals, regardless of whether they were directly moved with Maersk. While many of the terminals were able to come back online within a number of days, the industry was impacted for weeks while Maersk worked to bring different systems back up to speed. Disruptions to supply chains for this length of time can cause a significant bottleneck in the process of moving goods, and cost shippers millions of dollars. Much of the focus in the aftermath of Petya has been on protecting systems against this type of attack. According to the Journal of Commerce, U.S. ports receive $100 million annually from the Federal Emergency Management Agency to protect against cyberattacks. Terminal operators argue that this amount is insufficient as the increased integrations of supply chain systems means that this protection needs to be spread out to all members sharing information. Each organization will need to remain committed to ensure that their IT system defenses are strong, kept current, and that proper backup systems are in place to ensure a quick recovery should there be an attack or failure. While these types of processes can be expensive to maintain, the attack on Maersk can only further emphasize their importance. As the Senate Agriculture, Nutrition, and Forestry committee begins hearings to gear up for the next Farm Bill, the spotlight is shining on the validity of the “organic” label on food imports. Many politicians and domestic farmers believe that foreign countries are regularly labelling food “organic” fraudulently. A recent story in The Washington Post, which followed millions of pounds of falsely labelled soybeans and corn from Eastern Europe to the U.S., has further fueled the fiery debate and rhetoric on the subject. Not surprisingly, organic foods now make up over 5% of the total American food marketplace, and this total will certainly rise in the coming years. Perhaps disappointingly, American grain producers have been quite slow to re-tool for the organic market; some 70% of the organic soybeans and 50% of the organic corn consumed in the U.S. today are produced in foreign markets. As one might guess, the USDA and FDA are under tremendous pressure to prove that their oversight on presumably organic foodstuffs is both rigorous and comprehensive. As the new Farm Bill takes shape in the coming months and as U.S. farmers face tremendous marketplace shifts and competition, the scrutiny over imported organics will likely increase. At the risk of adopting an Op-Ed tone, what is certain to this writer is the expectation of increased vitriol and speech-making in the Capitol over organic imports. Branding, Trademarks, and Intellectual Property Rights have always been hot topics for e-commerce giant, Amazon, and their Fulfillment by Amazon (FBA) program. The issue has been attracting more attention as larger, well-known companies enter into the Amazon marketplace in hopes of reaching a bigger audience while securing market share. The growing threat comes in the form of FBA sellers who are distributing unauthorized or counterfeit goods. Amazon has an Anti-Counterfeiting Policy and denounces the sale of illegitimate products on their site. They have gone to great lengths to create restrictive product listings that block prospective counterfeit sellers at the front door, in addition to a brand registry program to help authentic sellers better protect their trademarked goods. As the issue stands, Amazon ultimately leaves the responsibility up to its sellers to make sure they are authentically distributing goods. Part of the problem is oversight. While parties are able to report fraudulent sellers, the process can take time with new sellers and storefronts popping up frequently. Big brands such as Birkenstock have ceased selling on Amazon due to concerns over counterfeit products. It is unknown how other well-known brands will fare as they decide to enter or remain in the Amazon marketplace and confront these issues. Nike announced this month that it is planning to open its own vendor storefront on Amazon, which could have substantial effects on sellers that are not authorized to sell Nike products. Until Amazon and other like marketplaces address the issue of fraudulent goods and eliminate listing and distribution of such products, e-commerce sellers, big and small, must continue to proactively address the issue of counterfeit items within the market. Since 2000, the total retail dollar amount spent by U.S. consumers on foreign produced wine has more than doubled from $26.3 billion to $55.8 billion in 2015, according to Statistica.com. U.S. consumers’ appetite for globally produced wine continues to increase due to a variety of factors. The U.S. dollar has strengthened in value significantly over the past three years relative to several important currencies, in turn making goods and services substantially more affordable for U.S. buyers. Michael Mondavi, who founded Folio Fine Wine Partners in 2004 and Michael Mondavi Family Estate in 2006 commented in a recent on-line article from Business Insider, "Whether it's with food or wine, millennials are saying, I like this, and I'm going to share that with my friends. Young people today have the confidence to express their preferences. I think that communication is now more important than the ratings of wines by experts." Forty and fifty years ago, the wine industry marketed primarily to the older generations. Today, according to Mondavi, younger people are more interested in wine than ever — and it reflects a major shift in how the modern American views food and drink. 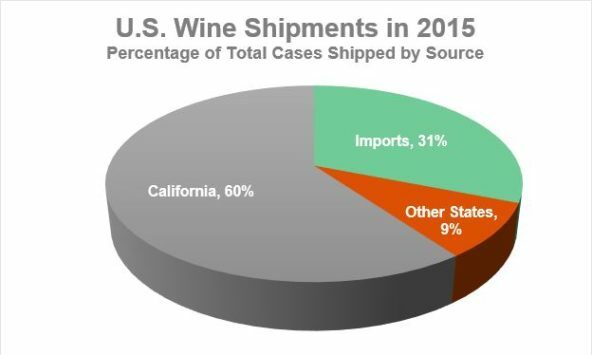 Per ShipCompliant, sales revenues for wine sold online hit $2 billion in 2015, an increase of 8.1% from 2014 with 4.2 million cases shipped. Purchasing wine online gives consumers access to a much broader selection of globally produced wines that they might not typically find in their local grocery store. Wine Spectator describes the online wine consumer as “more likely to be male, over the age of 40, married with children and have a higher household income. They also tend to be wine connoisseurs or enthusiasts and spend more on wine than non-online buyers. When these consumers buy wine online they are generally seeking higher quality wines. They are also quite tech savvy and are more likely to use phone apps or tablets to research wine information”. A Quick Look at Foreign Wine Consumption in the U.S. The U.S. remains the largest consumer group of wine in the world, recently passing France in 2013. Per Reuters, U.S. consumers ‎bought 29.1 million hectoliters of wine in 2013, an increase of 0.5 percent from 2012, while French consumption fell nearly 7 percent to 28.1 million hectoliters. Wine imports continue to trend upward as U.S. consumers find themselves increasingly partial to the palatability, abundant variety/access, flexible price points, and lifestyle that wine represents. U.S. apparel imports saw a slow start to 2017 and are still a bit sluggish, having declined by 1.9% YTD when compared to 2016 volumes. Despite the overall decrease, apparel imports from Vietnam, Nicaragua and Mexico actually increased during the first half of 2017. Vietnam leads the pack with an uptick of 5.5%, a significant growth that has helped them capture even more market share from a seemingly stagnant China. China’s market share has continued to decline year-over-year and fell .6% during the first half of 2017. The persistent decline in apparel imports is heavily attributable to a U.S. marketplace that continues to favor online retailers over brick and mortar shops. Every week it seems that a new brick and mortar retailer is going out of business, a fear that has caused many importers, some of whom used to account for the largest import volumes to the U.S., to maintain a significantly diminished inventory. On the other side of the spectrum, the majority of online apparel retailers are not large enough to fulfill the void created by the absence of larger orders from the brick and mortar shops. Rather, online retailers tend to focus on much smaller, more frequent orders with fast lead times – a makeup that decidedly favors the operational capabilities of the more tech-heavy, Vietnamese factories. In the latest major consolidation in the ocean carrier business, Orient Overseas (International) Ltd, the parent of Orient Overseas Container Line (OOCL), sold to Cosco Shipping Holdings (Cosco) for $6.3B in early July. The acquisition creates the world’s third largest ocean carrier by capacity, pushing CMA/CGM into fourth place. Only Maersk Lines and MSC are larger, and this puts 70% of the world’s shipping in the hands of only six major carriers. The operational integration of the two companies should be fairly straightforward since they are already members of the Ocean Alliance and operate primarily in east-west routes. There is speculation that there will be more complications and redundancies on inter-Asia routes. Cosco gains the world’s largest vessel in the deal with several more mega-vessels on the books for production. Many experts believe that the greatest strategic gain for Cosco is from a marketing perspective. Whether it is fair or not, Cosco has a very China-centric reputation while OOCL is seen as a global carrier and counts many famous global companies as loyal customers. Many port terminals are included in the overall deal, and Cosco will end up with roughly 30% of port capacity in Los Angeles by 2020. Cosco will also have increased control of Kaohsiung, Tianjin, and Ningbo terminals, among others. Because most of the remaining mid-sized carriers are largely state-owned, Drewry Shipping Consultants commented, “…there aren’t many other takeover candidates on the shelf… there could still be some minor regional acquisitions, but the big wave of M&A looks to have been concluded with this deal.” It is believed that regulators will provide firm resistance for future major acquisitions or mergers since the competitive landscape is now populated with so few carriers. On Friday, August 4th members of the International Longshore and Warehouse Union (ILWU) voted to extend their existing labor agreement with the Pacific Maritime Association (PMA) by 3 years. The current contract was set to expire on July 1st, 2019 while the new extension will validate the contract through July 1st, 2022. Despite mixed feelings leading up to the vote, the outcome was rather decisive with 67% of members voting in favor of the extension, leaving only 33% in opposition. Not once, since its founding in 1937, has the ILWU voted in favor of a contract extension. Rather, the time-tested practice of the ILWU has been to boycott work prior to any negotiation, which, according to the JOC, “…is easy money for the ILWU because asset-intensive terminals cannot afford protracted slowdowns and will inevitably buckle under union pressure.” Though this statement has held true in the past, the ILWU failed to account for significantly reduced volume as a result of their continued disruptions – what good is higher pay and guaranteed overtime when the demand for labor is shrinking? The tactics of the ILWU during the negotiations of 2014/2015, which brought West Coast cargo to a screeching halt, marked the first years wherein shippers significantly retaliated against the boycotting tactics of the ILWU. During this time a myriad of shippers diverted their cargo to the far less disruptive East Coast and Gulf Coast ports, and these shippers have continued to move their cargo via these new routings as a means of out-maneuvering the fickle and disruptive West Coast ports. Many analysts estimate that West Coast ports lost upward of 700,000 TEU’s worth of business during this time, most of which has still not been recovered. Hence, the 2017 vote could be seen as the ILWU attempting to make amends with shippers. Regardless of shippers’ initial reactions and concerns, the ILWU and PMA are hopeful that the newly minted contract will provide a glimmering beacon of stability and encourage shippers to further utilize West Coast ports. Global air freight growth is trending ahead of industry forecasts, and while some are hopeful that the remaining five months will be just as promising, others caution against making such optimistic predictions. Traditionally there is a point where manufacturing slows and inventory levels reach a peak in the brick and mortar structure. However, the steady rise in e-commerce sales is a definite buoy for air freight. Capacity increased 4.8% in June in the Asia Pacific market, and load factors rose, almost in tandem, to 3.1%. The U.S. trucking sector predicts a continual rise in year-over-year tonnage through 2023, and many European airports are reporting healthy growth of handled cargo volumes in June. Air import rates from China rose at the beginning of the month, adding to already elevated rates that defied the traditional Spring slack season. That upward momentum has leveled off in the last two weeks, but is expected to rise again in mid to late August with anticipated electronics releases along with reductions in summer passenger capacity leading into air peak season. With the summer-autumn peak season upon us, focus has shifted toward equipment availability and operations surrounding the LA/LB ports; specifically, chassis availability. Since its launch in March 2015, the Pool of Pools (PoP) has aimed to help improve chassis availability via equipment sharing amongst three major Intermodal Equipment Providers (IEPs). Despite record container volumes in 2017 thus far, the PoP (along with other assorted operations) has been able to thwart any significant chassis shortage. That being said, there is still a need for carriers, terminal operators, truckers, and IEPs to work to identify any warning signs of sudden disruption. Pointing towards one area of concern, Alan McCorkle, Vice President of Yusen Terminals, has stated that “the chassis supply right now is good, but the out-of-service chassis are still well above the target.” In addition to a sizeable number of chassis sitting idle pending service, the port is also experiencing some concerns regarding chassis dislocation. In June 2017, it is estimated that 53% of chassis in the PoP were deemed to be dislocated, i.e. they were not returned to the same location they were picked up from. Typically, this sort of dislocation tends to be a wash through the standard operations within the port, but it is possible that the higher volumes associated with the summer-autumn peak season could have a significant effect on the existing capacity. LA/LB truckers have also expressed optimism as it pertains to the upcoming peak season. While container volumes the past two years have continued to grow, truck turn times at the LA/LB port have only risen slightly: 84 minutes on average for May/June 2017 and 81 and 88 minutes in January and February respectively, as the pre-Chinese New Year spike in cargo volume hit the port – a potential indicator of the effects this year’s peak-season volume could have on truck turn times. In response to such opportunities for development the LA/LB ports have since finalized their initial 2-month pilot, tackling the creation of an information portal in hopes of increasing visibility and improving operations. Though officials are currently evaluating the results, many believe the benefits of the information portal are promising. It appears the LA/LB ports have shifted their focus towards identifying potential bottlenecks and opportunities to enhance services, while making a significant impact on operations, even in the face of record volumes. Shapiro continued its longstanding tradition of serving its customers, vendors, and employees by hosting its annual Summer Supply Chain Seminar. Panels of industry experts covered the most pressing topics facing the logistics industry today. Freight panel discussions covered Vessel Sharing Agreements (VSA), the current logistics and freight markets, capacity and supply/demand imbalances, terminal operations, U.S. infrastructure, chassis challenges, and various regulatory compliance topics. Following the seminar, Shapiro shuttled employees and attendees to the Propeller Club’s annual Crab Feast at Conrad Ruth’s Villa in Middle River, MD. The event, which attracts thousands, is arguably the most popular industry gathering of the year. The feast is a fundraiser for the Propeller Club, enabling the group to make significant contributions to various non-profit maritime organizations. Shapiro’s Educational Committee announced the winner of their annual student scholarship program. The scholarship, open to all Shapiro employees’ children, is granted after a rigorous evaluation process comprised of academic achievement records, letters of recommendation, a personal statement and an essay from each candidate. The winner, Rachel Kimmel, received a $2,000 scholarship for her college studies. Shapiro’s commitment to education extends deep into their culture, and they contributed funding and teaching hours to the University of Baltimore’s Export Import Management course in the Merrick School of Business. The Company also maintains an internal education program, Shapiro University, for employees to learn and cross-train in varying career paths; additionally, Shapiro covers tuition for qualifying courses (and qualifying performance levels) for employees who seek continuing education outside Shapiro. 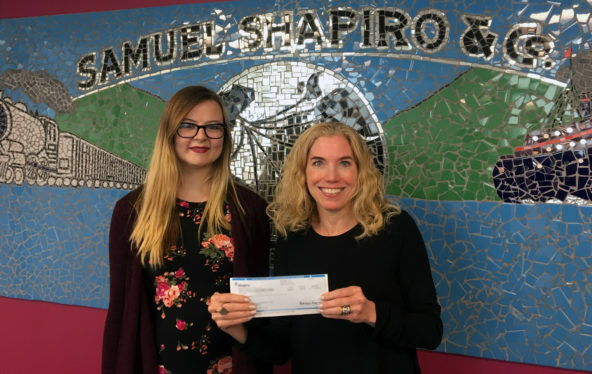 Rachel Kimmel, the winner of Shapiro’s 2017 student scholarship, is a Forensic Chemistry major with a concentration in DNA analysis at Towson University. She is set to graduate in May of 2018 and plans to begin working on her Master’s degree in Genetics. Rachel is seeking to work as a DNA analyst for the government after obtaining her bachelor's degree, and ultimately she hopes to conduct medical research for gene therapy to cure diseases caused by mutations, such as cancer, Tay-Sachs disease, and other genetic disorders. As previously featured in Shap Talk, Shapiro has been sharing the names of employees who have been recognized for their exceptional efforts and contributions to our Company. At Shapiro, we continually work to develop, challenge, and inspire all of our employees to grow individually and with the Company. This month, we would like to recognize Greg Livingston, Programmer Analyst in Baltimore for his outstanding performance and contributions.